Camy's Loft: Going no or low sugar - thoughts? Going no or low sugar - thoughts? If you’ve gone no sugar or low sugar, please chime in here, because I could use some advice. I’d like to go low sugar. Partly because my friend Dineen’s husband did it and lost a ton of weight, and partly because I’m wondering if I have insulin resistance, which is forming an evil trifecta with my possible thyroid problems and premenopause. I found out a few weeks ago after talking to my mom that both sides of my family has had thyroid problems, and I’m pretty positive I’m in premenopause because of various symptoms, the most painful of which are migraine headaches on the second day of my period every month like clockwork (and I never had a migraine in my entire life before October last year). If I do have low progesterone because of the premenopause, that would contribute to the possible thyroid problems. I have ordered supplements to help with the premenopause, but I was reading that it is often hard to treat low progesterone if you are insulin resistant. And one symptom of insulin resistance is carbohydrate cravings. If by “cravings” they mean "she turns into a rabid dog at the first whiff of French fries," then I might have some carb cravings. I don’t know for sure if I have insulin resistance, but I also know that going low sugar isn’t a bad thing, especially since I am trying to lose weight. So when you go low sugar, do you cut out all fruit and dairy too? Most of my dairy intake is from nonfat milk and low fat yogurt, which helps my digestive tract. I’m okay with going low fruit for a month or two, and I don’t drink fruit juices in general. Camy—welcome to my world! I get HUGE hormone headaches during my cycle thanks to “the change.” I also often get very nauseated. I have been sugar free for two years on this go-round. (I’ve done it several times before because I know that my body just can’t handle sugar.) First of all, the carb cravings do lessen over time. But if you’re as messed up as I am, there are some things you just have to avoid completely because if you have even one bite, you just keep going till it’s all gone. I’ve had to accept the fact that for me, there is no such thing as eating sweets “in moderation.” And potatoes and rice are a real downfall for me too. I try to avoid them, but I don’t always succeed! I don’t have any refined sugar at all, or anything with high-fructose corn syrup. I don’t have dairy except for occasional cheese and a little bit of half and half in my tea. For fruit I mostly stick to berries. I do have 2-3 teaspoons of honey or agave nectar in my tea every day, but that’s the only sweetener I use. Of course, a couple times a year I cut out all dairy, fruit, and even the agave nectar to do a candida cleanse, because I have ongoing candida issues. I found out about my sugar issues totally by accident! My husband and I decided to lose some weight a few years back, so our doctor had us do a cleanse (Isagenix) and then South Beach. The first week was hard because it was no carbs and no sugar. But after a couple weeks I realized that not only was I losing weight, my headaches were gone too. My daughter has sensory integration issues, and once I took out the sugar, she was a completely different person! So ever since, I've tried to keep my sugar intake low. I use Raw Sugar - before it's refined - and honey for sweeteners. I'm still getting used to Stevia. I know now that whenever I have sugar, I'm gonna crave carbs too. It's a vicious cycle. Potatoes Not Prozac by Kathleen DesMaisons, PhD. Suicide by Sugar by Nancy Appleton, PhD - that talks about Homeostasis and how sugar throws it off. I believe you'll find that the migraines are caused by not enough minerals (because sugar blocks them) in your system at the time of your headaches. Good luck with the bad sugar! I went cold turkey on sugar (and all refined carbs) when I was diagnosed with diabetes five years ago. It was tough at first, but I got used to it within a few months. I did not give up fruit or dairy, but I don't eat fruit alone; I always try to eat it with protein (nuts work well) to slow down the rise in blood sugar. Fructose is not poison to your body the way glucose is. I do use a little Splenda in my coffee and sometimes indulge in sugar-free chocolate or ice cream--I never lost my chocolate cravings. :) But I'm not even tempted by most sweets these days. 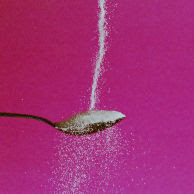 Sugar is an addiction for some of us, and it's worth the effort to break it. Try to go with whole-grain, high-fiber carbs as much as you can, and your carb cravings will likely diminish. I was nearly no sugar for several years. Then I allowed myself some Christmas goodies and I've been off the wagon for a year and a half and struggling to climb back on. For me it's pretty much all or nothing. If I just go low sugar then my cravings don't die. The only way to get rid of them is to starve them. No sugar. For me that means refined white sugar or HFCS. I still use honey, agave, fruit, and will eat things that have cane syrup because it's not refined. Those things don't seem to trigger my cravings. I felt better. I stayed at a constant weight, no matter what else I ate. I really want to get back there, but it's SO hard this time! But after a week or two off it really does get easier. You guys are awesome! Thanks so much for the tips! I'm relieved to hear I can still use a little honey and agave. I'm not a huge sweetener person, but I do like a little honey with my yogurt every morning, so it's good to know that eventually I'll be able to add honey back into my diet. I'm also glad to hear some of you still are able to eat berries. I was worried I'd have to cut out all fruit. I'm sad to hear the cravings don't really go away, but I'm glad to hear that it does get better eventually. When I was off sugar I didn't have any cravings. Sometimes I would make a conscious choice to have a little something. Very rarely. And then the next day I would crave a little, but I would fight it off and be good as long as I didn't eat any more sugar. My problem was the last time I gave in I had more than a little something and then I didn't fight the cravings, I just kept giving in. Seriously??? NO cravings when you're off sugar? Wow now that's encouraging! Thanks, Kay! I use very little sugar. I have surprised myself by not craving chocolate anymore. I've always been a big bread eater, love it, love it. I eat very little bread now and it doesn't bother me to not have it. I have thyroid problems and I fight with my weight. I do feel better not eating sugar and bread, but I do use honey some. You can do it girl! I have Hashimoto's thyroiditis (autoimmune thyroid problem) and have been borderline Diabetic II for 45 years. I gave up fruit juices like you and am not trying to remember to have a protein when I eat fruit. My problem is not so much giving up sugar but how to find a diet that is both diabetic and lacto ovo vegetarian friendly. I can find vegan diets that are good for diabetics but I don't want to give up eggs and yogurt. I'm with Kay. I didn't have cravings after a while. As long as I didn't have carbs, I didn't crave sugar...and as long as I didn't have sugar, I didn't crave carbs. To be honest, after three weeks, I didn't crave chocolate anymore either. That is HUGE for me! Thanks so much for sharing your experiences, guys! You all are really encouraging for me! Carol, I've read about Hashimoto's. And in combination with diabetes, that's really tough. Can you just tweak a diabetic vegan diet to include eggs and yogurt? I can't give up my yogurt, either! I need to go on a no sugar diet now but just can't get myself motivated with all the projects I have going on at this time. I can't make it without my sugar fix. Congrats on staying true to your diet and hope your cravings will to away. I was dx with hashimoto's in 1956. I have been on synthroid ever since. It seems my thyroid was destroyed and have been taking synthroid replacement tabs. Hang in there Camy, you can do it. See a doctor, Camy. A blood test revealed a dangerously low B-12 deficiency for me. It can uncover your thyroid issues and lead to treatment. I've been low carb, off and on, for the past seven years, since my first bout of gestational diabetes. I've gone completely no carb at times but find that too difficult for me to maintain and my weight loss jump starts then stalls. Low carb is slower for weight loss but more steady, I find. I rarely do fruit and when I do, I try to low glycemic ones like apples, pears, or bananas. Each person is different. Grapes are low glycemic but they make my blood sugar crazy. I stay away from starchy foods, like processed stuff, rice, pasta, and potatoes, even the brown or whole wheat varieties. That works best for me whereas you may have different results. I recently learned, from my doctor, that I need to reduce my nut/peanut butter intake because that has been interfering with my weight loss efforts. High protein but also high fat. A doctor who is well-versed in women's and weight loss issues can walk beside you step by step to help you achieve your goals. Patricia--thanks for the tips! I'm also avoiding peanuts right now because I read that it might complicate thyroid function. The supplements I'm on also include telephone consults with a nutritionist, which is one of the reasons I chose this program. If the supplements don't work, I'll give them a call. So far they seem to be working fine--I had a lot of energy yesterday and I do today, too!